Poets, painters, and writers have long celebrated the calming effects of being near the water, but recent science backs up the idea that water has a soothing effect on our psyches. Indeed, coastal living has been shown to improve our sense of physical and emotional health: it simply helps us relax. Now imagine yourself embracing relaxation with a warm mug of coffee in hand, gazing out across the rippling lagoon, or the crashing waves, and feeling utterly at peace. Once you’ve purchased and fixed up your dream waterfront home, next you’ll want the perfect coffee setup to become the embodiment of your zen-self. Do you like to start your day with a bold brew to wake up your senses? Try a dark or French roast coffee that tends to have a richer aroma and full-bodied flavor. But if it’s a pure caffeine boost you seek, lighter roasts can often pack more of a punch, as less of the mass of the coffee bean has been roasted away. The main difference between light and dark roast beans, however, is in the flavor, and a lighter roast tends to taste more acidic yet more fruity and nuanced. Of course, you might also prefer your coffee to taste more like dessert, in which case, flavored varieties like hazelnut or vanilla might suit you and pair well with a dose of sugar and cream. There’s also a wide array of decaffeinated coffees for any flavor profile. Today most grocery stores sell a variety of coffee beans all with interesting sourcing stories – locally brewed; fair trade organic; artisan. Try exploring coffees from different regions and roasted by different producers to see what you like. 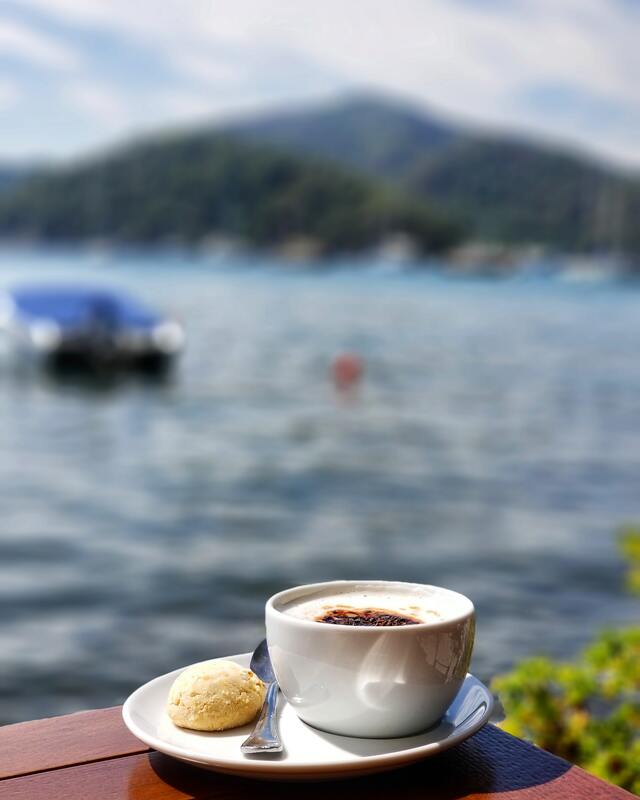 It can be a joy to relax on your porch overlooking the water, sipping coffee from a far-flung region and comparing tasting notes with a companion. There are also many coffee subscription clubs you can now join to sample different beans every month. There are quite a few ways to brew a relaxing cup of joe, so choose the method and the gear that suits your lifestyle. If you want a quick, single cup, you might opt for a single-serve brewer that takes pods or cups. It’s by far the easiest way to get your coffee fix, but the downsides are that the brew tends to be weaker, and there is considerable packaging waste involved. Another great option for the single-serve solution is a pour-over cone. This simple method relies on the slow drip of the coffee through a cone you place over the cup, but the trick is you cannot rush it. To get a rich brew, you must pour the hot water gradually through the coffee grounds. If you’re making coffee for two or more people, a French press is fairly simple and makes for a more full-bodied cup. Meanwhile, a traditional drip coffee maker makes a less bold coffee, but is pretty foolproof to operate, and has the important benefit of keeping the coffee warm until you’re ready to serve it up. Once you’ve selected the ideal gear for your coffee station, make sure you know the appropriate grind size for your coffee apparatus. It can make all the difference in your coffee being thick, ick, or just right. Now that you have the best beans, the brewing gear, and an aromatic cup of joe in your hands, it’s time to retreat to your water view spot to enjoy a moment of zen. Designate a spot on your deck, or a seat near the window, with comfy, reclined seats for two and a side table for coffee cups and crossword puzzles. Sit back, sip…and enjoy! This entry was posted in Blog and tagged coffee, Properties on The water, Water View Properties, waterfront on February 4, 2019 by admin.